I get it. You may feel like everyone has an online business or a blog of some sort these days, but that shouldn’t discourage you from going after that dream business or that blog you’ve always wanted to start. I’ve always loved blogging, and started my first blog back in 2010, but I had absolutely no idea I would end up starting a small business one day. To be honest with you, I never created a formal business plan when I started my first business, and didn’t have any sort of strategy in place with my first blog. I went in blind and had to figure things out as I went along. 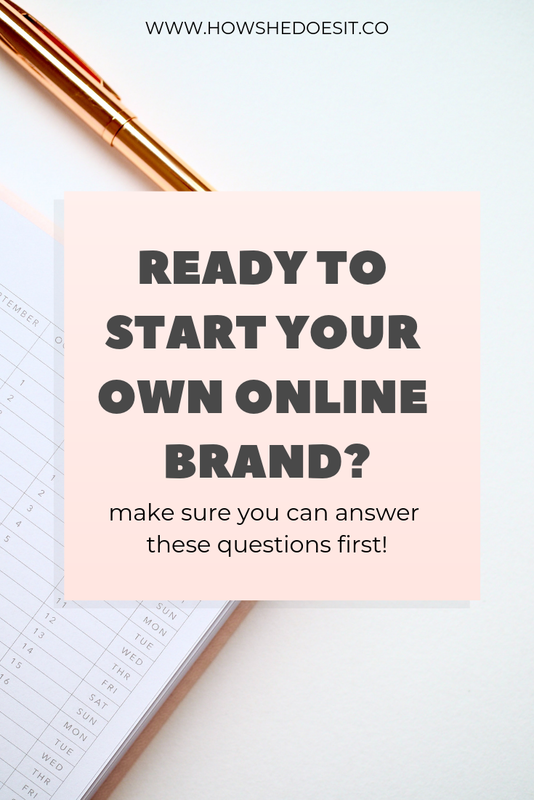 Looking back, of course there are plenty of things I wish I would’ve done differently in the beginning, but something that helped guide me through and keep me on track with my online brands were a series of questions I made sure to ask myself, which is what I’m sharing with you below. For starters — what is your brand about? First of all, are you a blogger? A business owner? If you’re a blogger, do you plan on turning your blog into a business by selling digital products or services? If you’re an aspiring business owner, do you currently run a brick and mortar business or plan to market your products or services solely online? What is your niche? What will you focus on when you start your blog? What area of business will you go into? If you’re a business owner, what products or services are you selling? If you’re a blogger, what topics will you cover? What problems are you solving with your brand? Why would people read your blog or invest in your products/services? What is your brand’s mission? What is your why? Take some time to answer these questions before you think about some of the items below. Who is your target audience or target market? Who are you writing to? Who are you selling to? How does your product, service or content solve a problem they are experiencing? Identifying your target market or target audience helps you start to figure out how you can market your brand, bring more traffic to your website and create valuable content. Disclaimer: This section contains affiliate links. I receive a small commission if you sign up or purchase through my link at no additional cost to you. Thank you so much for your support! Pinterest — registering for a business account and implementing specific strategies to grow your brand and drive traffic to your site to increase sales, clients and readers. I’ve even created a course to show you exactly how to increase your website traffic by using Pinterest! I’ll get into some specifics around online marketing in another post because there’s a lot to talk about here, but in my experience I’ve found it most manageable to focus your efforts on two to three platforms so you don’t spread yourself too thin. Try and figure out where your target market is hanging out the most, and get really good at marketing on those platforms first. It’s tempting to want to tap into all of the platforms above, but it can be incredibly overwhelming to juggle everything at once, especially if you’re just starting out. Regardless of where you are in establishing an online brand, it’s always helpful to refer back to these questions before and during the process. While there is certainly so much more to consider when creating a new blog or online business, getting clear on these essential questions helps to shape some of your future decisions.